It’s Sunderland today in the Premier League and the manager has a few decisions to make in terms of his team. Without the suspended Granit Xhaka, we might well see Mohamed Elneny and Francis Coquelin continue in midfield, depending on how well Santi Cazorla came through a fitness test yesterday. He, along with Theo Walcott (minor hamstring alert) and Nacho Monreal, are ‘little uncertainties’ according to the boss. Aaron Ramsey is back in the squad but unlikely to be handed a start, with Arsene Wenger saying had to be especially cautious with him. So, Gibbs for Monreal is obvious, while if Walcott doesn’t make it you’d have to think that Alex Oxlade-Chamberlain is the man to take his place after his two goals in midweek against Reading. Giroud and Sanchez are completely different, but they can as well play together. I have to move Alexis out as I always have that problem with Mesut Ozil being behind the striker, he can not move much deeper. As much deeper you need defensively to work. So one will have to move wide. And if you move one of them wide, it can only be Alexis. Which is something everybody understands, I’m sure. You can’t play Giroud from a wide area. Unlike Welbeck or even Lucas Perez, he’s only a centre-forward, he’s not versatile in terms of his position. Today though, I’d be very surprised if he tinkered with the team that much. 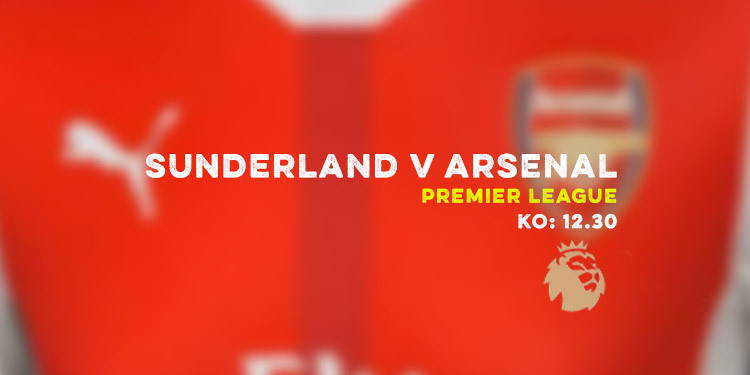 Firstly, it’s been working pretty well with Alexis up front and if we click today we should be able to cause Sunderland plenty of problems. Secondly, with today’s hosts likely to have looked at what Burnley and Boro did to frustrate us, we might need that fabled Plan B later in the game. If we start Giroud, we really don’t have anyone else on the bench who might provide that, not to mention we have very little cover from an attacking point of view anyway. There’s no Welbeck or Lucas, Walcott might be out, and even Chuba Akpom – who could provide a striking option that far down the list – is sidelined with a back injury. So, the Frenchman is our only potential game changer up front if we find ourselves struggling to break down a deep-lying defence. Ramsey could give us something from midfield, of course, but I think today he’ll look at those two players as ones who can help changes things if need be. Honestly, my natural tendency would say they sit deep and get us on the break. But at Southampton on Wednesday night they played quite high, so certainly David Moyes has tried a different solution. If they play quite high today, you’d be confident of our ability to exploit the space they’ll leave behind. If they sit deep and defend en masse it’s going to be a good challenge for us to show that this is something we can deal with when we face teams lower down the table. With a trip to Bulgaria in midweek and a North London derby next weekend, today is an important game in terms of getting the momentum going again. Last weekend was a bit of a blip, so today is one of those that we have to make sure of. It’s very frustrating. He worked very hard to get and now he’s close … he’s of course absolutely gutted. It’s an injury from nowhere, and a stupid one because it was a kick … a deliberate kick. So, a blow for the player and for us, especially as we head towards a particularly busy time of the season. Perhaps our new pitch which helps injured players, and the fact that we’ve seen others come back from injury ahead of schedule, will see Lucas make a comeback quicker than that. Let’s keep fingers crossed he’s quick healer. Finally, Jack Wilshere says that being left out of an England squad he really had no reason to think he’d be in other than because of his reputation was the ‘final straw’ in his decision to make a move away from Arsenal. He also said that the manage bringing in other midfielders – in particular the £35m signing of Granit Xhaka – played a part in his decision. While I understand his desire to play regularly, there’s always been a part of me that thinks he took the easy option. Rather than fight for his place at a big club, he took a step down and from there it’s not always easy to make the step back up. He surely had to understand that he needed to work his way back into the Arsenal team after so long out injured, and he was involved in our first few games of the season. He wasn’t unused even if he was coming off the bench. The idea that being left out of the England squad was the thing that tipped him over the edge is a bit unfortunate really. Let’s see how he does at Bournemouth, but he’s given himself a mighty task to regain his place here – especially as by the time he wants to return, the Arsenal midfield may have moved on without him. If you haven’t yet had a chance to listen to yesterday’s Arsecast, there’s pre-Sunderland chat with Goonerholic and I speak with ace cartoonist David Squires about his work and upcoming book (of which you can win one of two copies). Listen below. We’ll have full live blog coverage of the game for you. Join us later on for that. For now, there’s a large dog here that needs to go out. Catch you later.